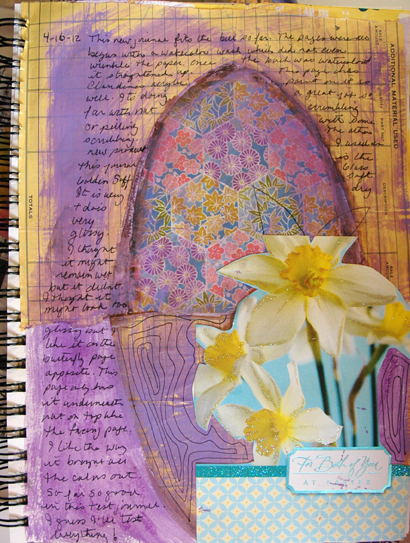 One page journal entry for a belated Easter, using as a focal point the beautiful card my Mom sent us. I love daffodils and we don’t have them down here in Florida. The background is an old car repair receipt from 1940, with Claudine’s Studio Paints over top and a semi-circle of Japanese print paper. I thought the printed paper referred to both a painted Easter egg and stained glass window. It was meant to be egg-ish and shrine-ish all at the same time. Asking it to work overtime. I did a little doodling with curvy lines in the same Sharpie I journaled on the page with. 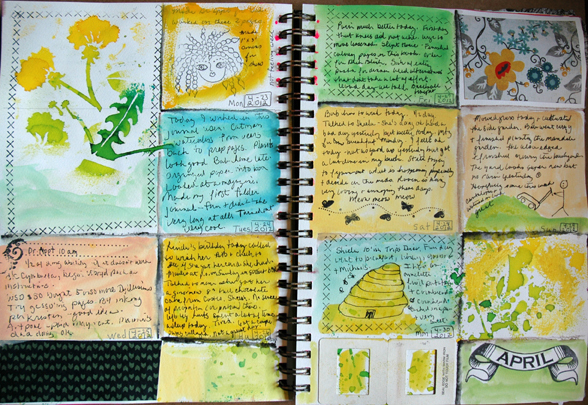 The first test page in my new journal, the Canson Artist Series All Media one. 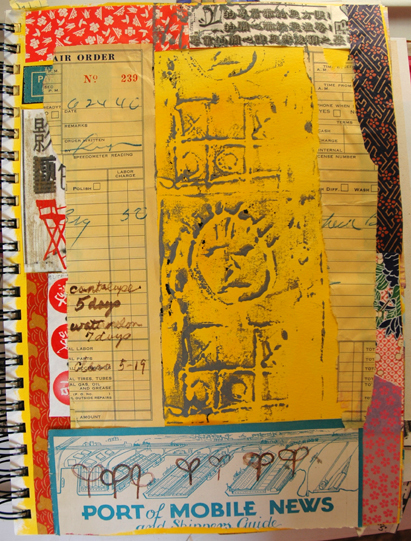 This page has a watercolor background in sunny yellow, washi paper, asian newspaper and graphic from a brochure for the border, a car repair receipt from 1940 off to the side of center and then two prints from a hand carved styrofoam plate in gray gesso. The journaling part is documentation of the germination of the seeds planted in my garden and little doodle drawings of the adorable sproutlings. I love working on pages like this that build from the scrap pile, then sing with a little handmade goodness like a spontaneous print. 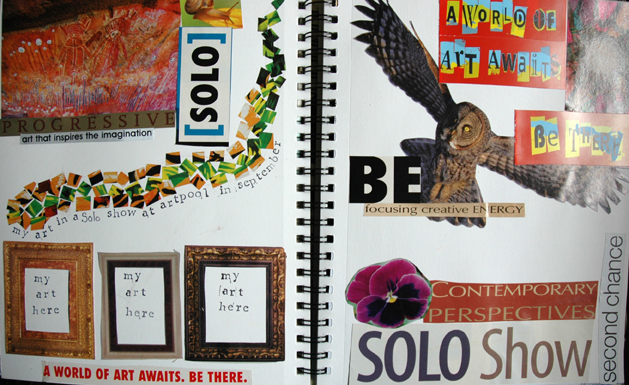 An art journal page from yesterday. I am working now into a new blank book. 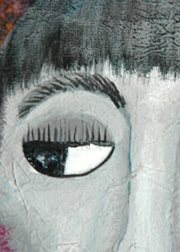 It is a Canson Artist Series “All Media” book that is taking water and medium very nicely. No pilling of paper or warping. The orange is watercolor foundation. 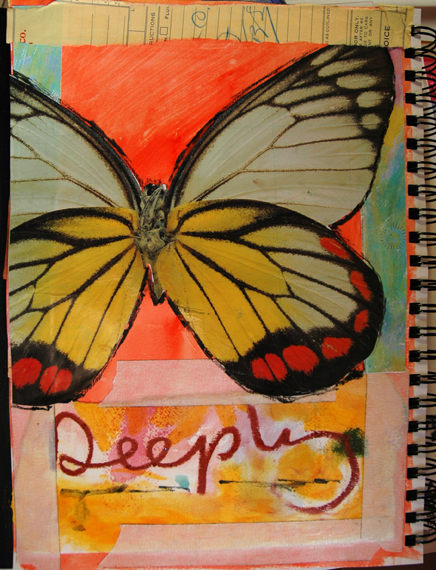 The bottom border is masking tape to hold the watercolor paper with “deeply” written on it in watercolor crayon. The butterfly is an image from an expired calendar. I used soft gel, gloss on this piece which is highly unusual for me. 95% of the time I work with matte finish and was surprised I even had any gloss. The problem with gloss in Florida is that sometimes it refuses to dry. However, this is Golden brand and performed beautifully. Since the calendar was already superglossy finish, it seemed appropriate to use the gloss medium. I did outline the butterfly with one of my favorite tools, the Stabilo All pencil in black. I bought the same pencil except in brown this weekend and like that one too. I love the water soluble quality of these pencils…they make a deep, intense mark. I drew/doodled this page in one sitting most likely while watching something on TV. I was playing around with drawing with fountain pens, something I’ve not done unless you count doodling in high school during steno class. But now we are going into the waaaaayyyyy baaaaaccckkkk and I can hardly tell for sure WHAT happened in high school. I know steno is long gone. Anyway, I have several fountain pens, one that eeks out a little ink here and there so it makes a nice scratchy drawing (I believe most of the angel was done with that pen). The other real fountain pen delivers a very nice inking on demand and is likely responsible for lettering and text in this doodle. The color is some cheapy disposable fountain pens I bought a long time ago that – shock – still work. Every now and then I get in the mood to work like this. I’ll start off with one drawing and begin to turn the page and change the orientation as I go along. That way, the page has some interest. It’s a very stream of consciousness process and all kinds of bibs and bobs turn up in there. Try it one day while watching TV or when on the phone for a long time. Lots of times, I don’t even remember drawing most of the stuff. 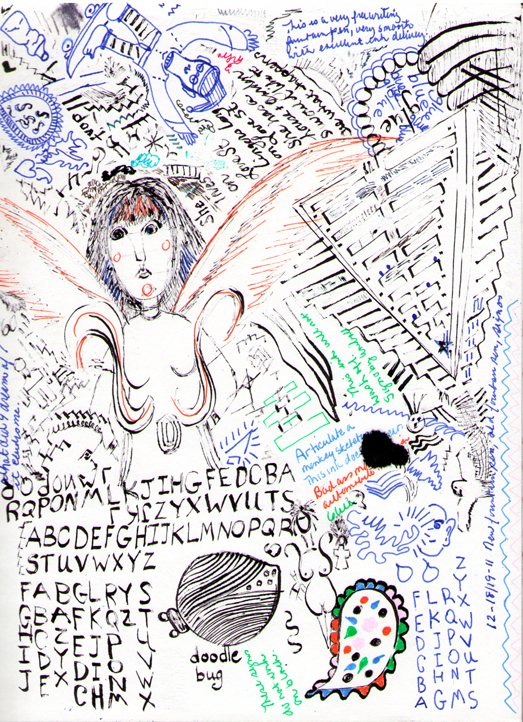 This page was rediscovered as I was sorting through some journals…I had forgotten I’d even drawn it.